Wire termination is the point where a wire starts or ends. For this end of the conductor to be able to transmit an electrical signal to another device, the customary practice used to require soldering which was both time consuming and costly. Now, however, this process can be done through wire crimping. A wire crimp is a connector, and it allows two circuits to be connected without using soldering. This means that the connection can be temporary if needed. Wire crimping involves placing a metal crimp on the wire termination. 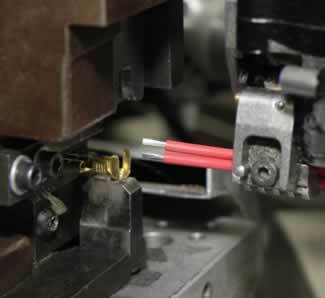 Then, a tool is placed on over the crimp and squeezed, crushing it around the bare wires and around the wire jacket. This ensures a secure connection. Because different applications require different contacts, Omega Leads inventories a wide range of wire terminals, in a multitude of configurations. We utilize automatic wire crimping and wire termination equipment to install our terminals and ensure secure attachment. Our wire termination and crimping capabilities enable us to process wires in a large variety of sizes; we also have tooling and equipment for larger cable, as needed. Omega Leads’ wire termination capabilities can be combined with our custom wire harness and custom cable assembly manufacturing processes, as well as our wire identification and wire processing services. Our comprehensive manufacturing abilities enable us to create complete wiring systems for nearly any application. Omega Leads employs IPC/WHMA-A-620 quality standard for all our manufacturing processes, allowing us to manufacture wire harnesses and cable assemblies that meet or exceed your expectations. Each member of our production team goes through a training process that parallels the type of production they will be performing. Training on the equipment they will be operating helps eliminate production errors and ensure a timely production schedule to meet customer deadlines. Prior to any production, we perform crimp height dimensioning and a destructive pull test on all wire termination before production begins. All assembly follows strict quality control guidelines, and a final electrical test ensures that the finished product meets all industry standards. Our wire termination processes adhere to IPC/WHMA 620 standards. All Omega Leads products are made in the USA. We utilize state-of-the-art, computer controlled, automated equipment for reliable, repeatable wire termination in our wire harnesses and cable assemblies. This machinery can cut and strip wire ends, apply terminals, install terminal seals that create watertight seals, and tin-dip wire ends in a variety of specialty alloys. We have invested in this equipment to guarantee precision, repeatability, and uniformity, giving us a cost-competitive advantage. 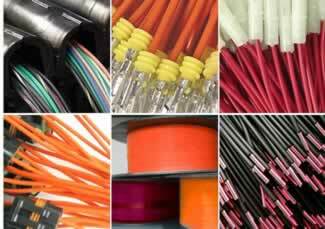 We can also supply our customers with high volume terminated lead wires and pigtails. Omega Leads provides dependable wire crimping and wire termination for all custom wiring products. Request a quote on your project, or contact us to learn more about our wire termination capabilities.